Carnegie: What Is The Real Agenda? The Strategic Resource Plan indicates a planned allocation of $2.95m for Shepparson Avenue Market Development for design, concept plans and initial consultation and there is also planned budget allocations for the market/library area in the 2018-19 Draft Annual Budget. This there a budget and timing estimate for the actual market? Council has prepared a Strategic Resource Plan (SRP) for the ten years 2018-19 to 2027-28 as part of its ongoing financial planning to assist in adopting a budget within a longer term strategic framework. At this stage, funding for construction of the Market Development has been provisionally allocated from 2028-29 to 2030-31. This timing will be dependent on community feedback, funding models and Council priorities. Hardly a ringing endorsement for anything! If the only true option is a ‘speciality’ food market that relies on the more ‘high income households’ of Malvern, then god help us. 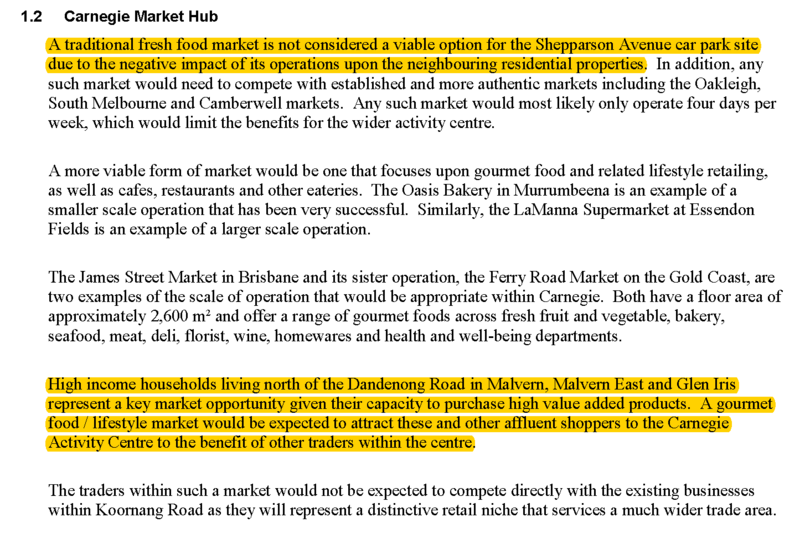 The examples that this report provides include the Oasis Bakery in North Road and a site in Brisbane. Significantly, no mention is made of the Prahran market in the heart of Malvern where we would expect these ‘high income households’ to do their shopping! That leaves us to question the efficacy of both the report and to question why council is so determined to pursue this option worth $3m just for plans! Three million for plans is not on. Business cases should be produced before any money is committed. The consultant’s report is wishy washy at best and nowhere near good enough to spend this kind of money on. Accepting what council has written means that we can look forward to about 13 years of nothing happening with the market in Carnegie – if ever. In the meantime development can go ahead unhindered. Council’s position has always been that the activity centres are there to draw in people and promote business. The draft budget and long term plans have forgotten all this for Carnegie. Instead it’s all about more and more development. The Council proposal of allocating $2.95M for design and concept plans is highly unusual to say the least. Concept plans don’t cost anywhere near this and it is unprecedented for detailed design to be completed 10 years in advance of construction. Fair question, what is going on here? It is not councils mandate to try and develop markets that are better left to private enterprise? For heavens sack council workers are not money managers. This is madness, at best council ego megalomaniacs. <Maybe council is trying to make use of the verandah covered footway which undoubtedly cost many thousands of ratepayers dollars and is useless.